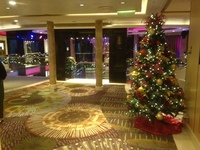 We just returned home from a fabulous 15 night Pre-Xmas Caribbean cruise aboard the P&O ship Azura. We flew into Barbados on a Tui Dreamliner from Manchester on the 1st December. The flight was comfortable and well serviced with complimentary food and drink. The price for 15 nights in a seaview cabin inclusive of flights, transfers and meals was £1750 pp with an on-board spend allowance of £140 pp. The Azura was built in 2010 and has a crew of 1200 and a passenger capacity of 3100 and has worn its 8 years well and is a lovely ship. We were located in cabin P325 conveniently on the same level as the atrium and close to all the shops and reception. 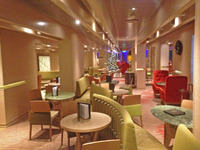 There are several dining rooms providing fixed or flexible, waiter served dining for breakfast and dinner, a casual self-serve buffet restaurant and four posh restaurants for which there is cover charge. We tried all of them. The standard dining (included in the price) was varied and the service excellent but the standard food whilst OK wouldn’t blow you away. The 24 hour self-serve buffet had a good variety but quality wasn’t great, but you will like it if you are not fussy. The best of the posh restaurants imho was the The Glass House which served great food, wine and drinks, contemporary décor, great service and was the best value with a relatively modest cover charge which varied with what you had. The Indian fushion restaurant, Sindhu, was also very good, superb service, excellent choice of food, wine and other drinks, and a reasonable cover of £20 per head. The Epicurian restaurant was pretentious and over priced at £28 per head and, they couldn’t cook a steak properly. The Beachhouse was OK, roughly equal to your average pub grub with a cover of £7.50 per head. Drinks were wide and varied and seemed fairly priced. As a real ale drinker I didn’t expect to be bowled over but to be fair I found a couple bars serving reasonable bitter/ale but you have to ask them to serve it with a big head and let it warm up a bit, its always too cold. There were four formal black tie nights, which we personally don’t go for, so on those nights we dined in either the Glass House or Beach House, which did not require the penguin look. The itinery had four sea days. To be honest the first was day was not much fun, it was overcrowded on deck and if you didn’t get out with your towel before 9.00 you struggled to get a sunbed. The other three days got better as many passengers couldn’t be bothered and then there was space for everybody. There is an exclusive area called the Retreat which you pay for. It is spacious and never over-crowded but at £175 per person for 14 days it wouldn’t be! We tried to book it for just the 4 sea days but it was all or nothing we were told. I have to say service in all areas, be it restaurants, bars, coffee shops, general shops cabin stewards etc was first class and friendly and they couldn’t do enough for you. We had a seaview cabin. It was reasonably spacious, we went for a single beds layout, the shower and toilet was adequate and the walk-in style wardrobe and cupboard and safe more than good enough. There were brew facilities, a mini bar, hair drier, TV and climate control, and enough power points (UK) The ship was very stable and at times you had to look outside to see if it was moving. But enough about the ship, the ports of call are what its really about and with the exception of Tortola (which had still not fully recovered from last years hurricane) all were extremely interesting. In each case we took a private island tour provided by the many private hire taxis, in comfortable air conditioned SUVs carrying on average 8 persons at a cost of $25 per head. All had great guides speaking better English than wot I do! Now I know P&O will warn you all about the risks in doing this, but after all they want to sell their own over-priced alternative, we had no problems. 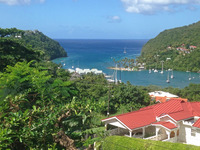 Our fave island was Antigua and we loved St Kitts. 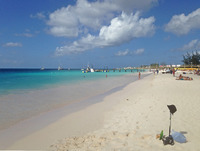 Our daily weather was just great with average temp of 28C, an odd shower and a refreshing breeze. Worth a mention was the 40 minute transfer to the ship from the airport in Barbados. Following an 8 hour flight P&O seem to think its OK to cram you all in a crammed bone shaker of a bus, with insufficient storage space for your travel case, no working seatbelts (well ours didn’t) with a driver who was in some sort of hurry whilst chatting on his phone. Not good enough P&O. But the check-in and embarkation was very efficient. So, there is no perfect cruise, it is a compromise, but as long as the good outweighs the bad then you are laughing, and on this cruise it did, very easily, and any little niggles were always satisfactorily resolved. So in a nutshell what was good :- All round service in bars and restaurants The Glass House and Sindhu restaurants Resident band Pulse Entertainment On-board activities Breakfasts (water service) Drinks Ports of call – all good Sail-away parties Cabin comfort Spa and gym Efficiency of embarking and disembarking at all ports Ships décor Galley tour (fantastic insight into what goes on behind the scenes) Manhatten lounge Live footy coverage in Brodies The huge number of bars and places to eat Daily news letter. Not so good :- The sea screen (movies under the stars) was not working – a major disappointment The Epicurian restaurant Many of public areas and bars were cold Transfer to ship in Barbados Onboard shops were over-priced Ships yours were over-priced Abysmal service on return flight Reception undermanned at peak times. So the big question is, would we do it again. We are missing it already and are planning our next one. 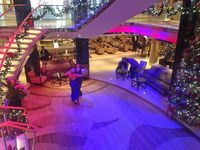 We just returned home from a fabulous 15 night Pre-Xmas Caribbean cruise aboard the P&O ship Azura. We flew into Barbados on a Tui Dreamliner from Manchester on the 1st December. The flight was comfortable and well serviced with complimentary food and drink. The price for 15 nights in a seaview cabin inclusive of flights, transfers and meals was £1750 pp with an on-board spend allowance of £140 pp. The Azura was built in 2010 and has a crew of 1200 and a passenger capacity of 3100 and has worn its 8 years well and is a lovely ship. We were located in cabin P325 conveniently on the same level as the atrium and close to all the shops and reception. There are several dining rooms providing fixed or flexible, waiter served dining for breakfast and dinner, a casual self-serve buffet restaurant and four posh restaurants for which there is cover charge. We tried all of them. The standard dining (included in the price) was varied and the service excellent but the standard food whilst OK wouldn’t blow you away. The 24 hour self-serve buffet had a good variety but quality wasn’t great, but you will like it if you are not fussy. The best of the posh restaurants imho was the The Glass House which served great food, wine and drinks, contemporary décor, great service and was the best value with a relatively modest cover charge which varied with what you had. The Indian fushion restaurant, Sindhu, was also very good, superb service, excellent choice of food, wine and other drinks, and a reasonable cover of £20 per head. The Epicurian restaurant was pretentious and over priced at £28 per head and, they couldn’t cook a steak properly. The Beachhouse was OK, roughly equal to your average pub grub with a cover of £7.50 per head. Drinks were wide and varied and seemed fairly priced. As a real ale drinker I didn’t expect to be bowled over but to be fair I found a couple bars serving reasonable bitter/ale but you have to ask them to serve it with a big head and let it warm up a bit, its always too cold. There were four formal black tie nights, which we personally don’t go for, so on those nights we dined in either the Glass House or Beach House, which did not require the penguin look. The itinery had four sea days. To be honest the first was day was not much fun, it was overcrowded on deck and if you didn’t get out with your towel before 9.00 you struggled to get a sunbed. The other three days got better as many passengers couldn’t be bothered and then there was space for everybody. There is an exclusive area called the Retreat which you pay for. It is spacious and never over-crowded but at £175 per person for 14 days it wouldn’t be! We tried to book it for just the 4 sea days but it was all or nothing we were told. I have to say service in all areas, be it restaurants, bars, coffee shops, general shops cabin stewards etc was first class and friendly and they couldn’t do enough for you. The ship was very stable and at times you had to look outside to see if it was moving. But enough about the ship, the ports of call are what its really about and with the exception of Tortola (which had still not fully recovered from last years hurricane) all were extremely interesting. In each case we took a private island tour provided by the many private hire taxis, in comfortable air conditioned SUVs carrying on average 8 persons at a cost of $25 per head. All had great guides speaking better English than wot I do! Now I know P&O will warn you all about the risks in doing this, but after all they want to sell their own over-priced alternative, we had no problems. 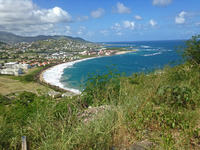 Our fave island was Antigua and we loved St Kitts. 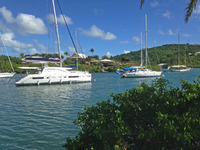 Our daily weather was just great with average temp of 28C, an odd shower and a refreshing breeze. Worth a mention was the 40 minute transfer to the ship from the airport in Barbados. Following an 8 hour flight P&O seem to think its OK to cram you all in a crammed bone shaker of a bus, with insufficient storage space for your travel case, no working seatbelts (well ours didn’t) with a driver who was in some sort of hurry whilst chatting on his phone. Not good enough P&O. 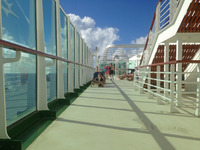 But the check-in and embarkation was very efficient. So, there is no perfect cruise, it is a compromise, but as long as the good outweighs the bad then you are laughing, and on this cruise it did, very easily, and any little niggles were always satisfactorily resolved. Reception undermanned at peak times. So the big question is, would we do it again. We are missing it already and are planning our next one. Cabin was more than adequate considering what we paid for the cruise. Reasonable spacious and good design with a kind of walk-in dressing and cloths hanger area. Safe was easy to use. Facilities were all ok. Ventilation and AC was good and controllable.